This season’s hottest staple piece. This bold red statement dress is your Spring calling. Featuring short double spaghetti straps falling into bare shoulders and split long sleeve flares, crafted in a mini length, curve-skimming silhouette. Understated and powerful, make this beautiful stand-out dress yours to rent for a birthday party or race day carnival. Pull your hair up into a bony and wrap a patterned ribbon to style. Or keep makeup light and glossy and hire a rose crown headpiece to decorate. Read our blog for more inspiration on pairing makeup to red coloured looks! FABRIC: Fabric has a little stretch. GREAT FOR: Petite, Straight body types. 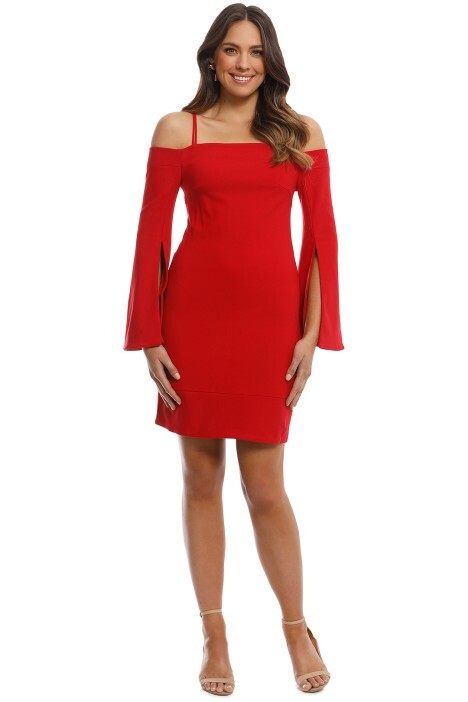 Tempo Dress - Red is rated 5.0 out of 5 by 2. Rated 5 out of 5 by Tin from Work christmas party SOOOOO happy with this rental - it was just perfect fit and selection of colour - also SOOOOO many compliments !! Rated 5 out of 5 by Janet from Raceday Rented this for Geelong Cup Day and loved it! So many compliments and it felt amazing and comfortable to wear.